It’s clear that people want helpful, personal, and frictionless interactions that allow them to shop wherever and however they want -- from making decisions on what to buy, to building baskets, to checking out more quickly than ever before. Put simply, they want an easier way to get their shopping tasks done. That’s why we’re introducing our Shopping Actions program. It gives customers an easy way to shop your products on the Google Assistant and Search with a universal cart, whether they’re on mobile, desktop or even a Google Home device. Surface your products on new platforms like the Google Assistant with voice shopping. Leverage our deep investments in machine learning, AI and natural language processing to offer your customers a hands-free, voice-driven shopping experience. Help your customers shop effortlessly with you, across Google. A shareable list, universal shopping cart and instant checkout with saved payment credentials work across Google.com and the Google Assistant -- allowing your customers to seamlessly turn browsing into buying. For example, shopper Kai can do a search on Google for moisturizing hand soap, see a sponsored listing for up & up brand soap from Target, and add it to a Google Express cart. Later, in the kitchen, Kai can reorder foil through voice, add it to the same cart using Google Home, and purchase all items at once through a Google-hosted checkout flow. Increase loyalty and engagement with your highest value customers. 1-click re-ordering, personalized recommendations, and basket-building turn one-time shoppers into repeat customers. If Kelly does a search for “peach blush,” for example, and she has opted to link her Google account with her Ultamate Rewards status, we’ll recognize this and surface relevant blush results as well as related items -- like makeup brushes -- from Ulta Beauty to help her build a basket with her preferred retailer. If we know she regularly purchases makeup remover on a monthly basis, we’ll surface the same brand of makeup remover to her, right when she has the highest intent to re-order. In addition, Shopping Actions uses a pay-per-sale model, meaning you only pay when a sale actually takes place. Shopping Actions appear within the sponsored Shopping Unit on the Google Search page, and on Google.com/Shopping. No organic rankings are impacted or changed. 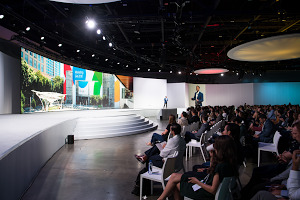 Target and Google have a long-standing partnership, and a history of innovating together to make shopping easier and more inspiring. Target was one of the first retailers to test Google Express (now Shopping Actions), and last year expanded the offering nationwide. Over the last six months, Target has seen the size of guests’ Express baskets increase by nearly 20%, with strong adoption in new markets. To learn more about Shopping Actions, sign up through our interest form to be contacted with more information, or check out our Help Center. We look forward to making the shopping journey more helpful, personal, and frictionless with you! 1. Google Data, US, Jan- Jun 2015 vs. Jan-Jun 2017. 2. Google/Peerless Insights, ‘Voice-Activated Speakers: People’s Lives Are Changing’, Aug. 2017, n=1,642, U.S. monthly active voice-activated speaker owners (Amazon Echo/Dot and Google Home), A18+. 3. Google internal data, Feb - March 2018. 4. Google internal data, Q1 2017 vs 2018 YTD. 5. Mastercard Pre / Post Analysis of Shopping Actions Performance, March 2018. Analysis conducted among MasterCard users of 5 high frequency Shopping Actions Merchants From 4/26/17 – 8/24/17 (Pre) compared to 9/30/17 – 1/28/18 (Post) among 660,171 Existing merchant customers (shopped in last 6 months) , 703,848 New merchant customers (did not shop in last 6 months) and the subset of Shopping Actions customers 10,963 (pre) 11,385 (post). 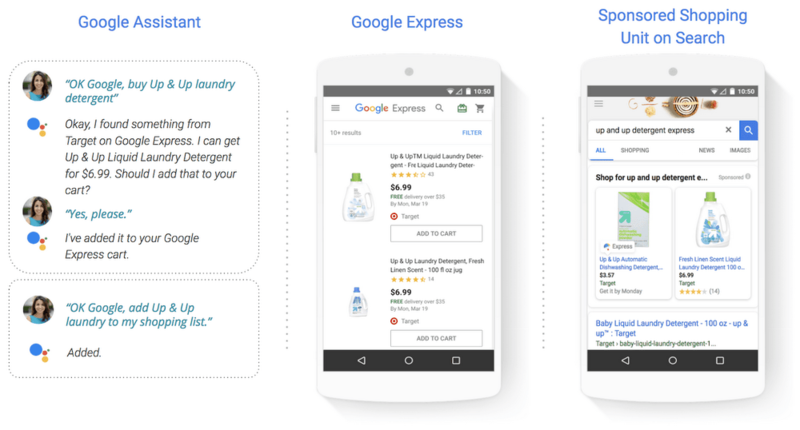 Additional $38 spent at merchants among Google Express Users in 4 month post period.